That description makes it sound like more of a psychological drama than it is. Jonas (Jason Statham) doesn’t really hesitate much when it comes to doing daring things. I mean, would you jump in the water with a spear gun to try to put a tracking tag on a shark the size of a semi trailer? There’s not much in the way of redemption, either, because Jonas never thought he did anything wrong. His concern is having people finally believe his story and understand that he did what he had to do under the circumstances. Likewise, the whole ex-wife onboard thing makes it seem as if it’s going to be an undersea version of Diehard, but that never plays out. The character of Lori (Jessica McNamee) could have been a complete stranger and the plot would have remained unchanged. I’m not so sure that the opening sequence, set five years earlier, adds much either, other than to misdirect audiences into thinking they’re going to see a movie that’s more “B” than it turns out to be. Once you get past that “something’s down there” sequence that didn’t need to be dramatized, it’s easy enough to get involved with the characters and their mission. Like Jurassic Park’s , Dr. Minway Zhang (Winston Chao) is involved with a top-secret, high-level science project that goes awry. Operating from a facility that to the casual eye looks like an oil rig platform, he’s trying to prove his theory that the Mariana Trench isn’t the deepest part of the ocean—that a thermocline cloud of hydrogen sulfide has sealed off an even deeper portion of the trench with a penetrable layer of cold that makes it look like ocean floor. 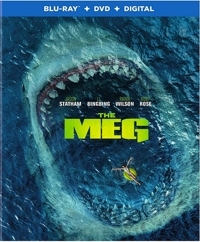 Funded by billionaire Jack Morris (Rainn Wilson) and assisted by his oceanographer daughter, Suyin (Li Bingbing), he sends the first exploratory submersible down, but their moment of triumph is crushed when a giant sea creature disables their probe and leaves them stranded in the now-new deepest part of the ocean. The rest of the film is a rescue mission and a Pandora’s Box story that finds the scientists trying to destroy what they’ve unleashed on the world before it can do too much damage. 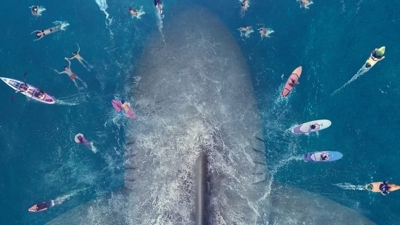 Viewers get some very Jaws-like beach and boat scenes (and more of them), along with a poster-style iconic moment that shows single parent Suyin’s daughter, Meiying (Sophia Cai) looking out from an underwater observation window when the gigantic Megalodon, thought to have gone extinct with the dinosaurs, makes a sizeable “impression.” The scenes with Jason and Meiying are actually among the most tender, and the presence of a child ups the ante for everyone when all hell breaks loose. There are other cast members, of course, but they seem to exist for practical purposes and to give viewers the chance to guess who’s going to make it and who’s going to be fish food. Sometimes it feels as if director Jon Turteltaub couldn’t make up his mind whether to make a straight-up thriller or a B-movie giggler. It’s hard to explain, but when you watch an extended sequence involving a Chinese wedding party at sea you’ll see what I mean. Ultimately, though, that confusion doesn’t get in the way of the film’s ability to thrill and to entertain. My college-age son is studying biology and has been a student of marine biology long enough to say whether something is bogus or not, and he praised the premise and the care with the filmmakers took in creating a believable-looking Megalodon—something that’s entirely speculative because only the teeth of the creature survived for scientists to study. My teenage daughter, who just loves scary movies, approved of the film because it had some genuinely frightening moments. Will it be for all children? Not remotely. People get chomped. Body parts are shown. There’s blood. But there’s also a PG-13 rating that, if parents know their children, would also probably include children age 10 and older.